Domestic Violence Research Papers study research in order to find out how to stop domestic abuse. Domestic violence research is necessary for a variety of reasons. Paper Masters provides custom research on domestic violence from any aspect you need, whether it be sociologically or from a criminal justice standpoint, Paper Masters has writers that can fulfill your request for domestic violence research. To prevent its occurrence and to treat the offender so that abuse will not recur. Determine treatment programs is necessary to determine what treatment will ultimately stop this behavior. Research how to stop domestic violence before it occurs. Past research papers on domestic violence have determined that inadequate research has been conducted in the treatment of domestic violence. Due to the reluctance of individuals to step forward to admit that they have been victims of domestic abuse, it is difficult to understand the circumstances and processes of the violence that occurs within a family. Therefore, scientific research and study has been limited in producing the necessary answers that would lead to treatment and a reduction of such crimes. Women abused by their husbands appear to be the most common type of domestic violence that occurs in the United States. They are especially reluctant to admit such victimization because of financial pressures. Women typically make two-thirds of the salary that men make and are especially limited in their resources to seek outside assistance. When children witness domestic violence as youngsters and then commit such violence as adults, this is often referred to as the “cycle of violence”. Whether this is factual or simply an untested hypothesis has not been adequately studied in the literature. A determination needs to be made how domestic abuse within the context of the family originates. In other words, is it learned or is this behavior acquired in another manner? The need to study the problem of domestic violence is great. Such research has only been conducted scientifically during the past twenty years. Thus, there are many unanswered questions regarding domestic violence as it currently exists. Because of the limitations in an understanding of this severe social problem, there is little understanding regarding effective treatment and prevention. Consequently, many abusers are often freed by the criminal justice system in order to abuse again and again. Abusers who continue to abuse may eventually murder their victim. Unfortunately, a large percentage of murders are committed by individuals who are supposed to love and care about their victims. Thus, without some type of intervention, the abuse experienced within the context of a family may become more severe. There is a great need in determining an appropriate and effective method of treatment to prevent or stop domestic abuse. An additional problem that needs study and research is the problem of modeling by young victims. In other words, children who are abused or who witness abuse occurring in their home may model that particular type of violence as adults. Thus, these children may require intervention in order to grow into healthy adults. To do so, may require some type of treatment. Thus, there are many purposes for researching domestic violence. The primary purpose is to ascertain the dynamics of domestic violence in order to prevent its occurrence and to treat the offender so that abuse will not recur. Thus, long-term research regarding treatment programs are necessary to determine what treatment will ultimately stop this behavior. Research papers have determined that inadequate research has been conducted in the treatment of domestic violence. Violence inflicted upon a wife by her husband has often been viewed as normal and expected, unfortunately. In ancient Rome, husbands had the legal right to “punish” their wives if they did not obey their rules. For a short period during the 300s, such violence displayed by the husband allowed the wife to seek a divorce legally. Later in the Middle Ages, a wife who violated her duties as dictated by society could be beaten legally by her husband. In fact, neighbors would expect such beatings to occur. Such violence was severe since marriages were often arranged rather then occurred out of feelings of love between husband and wife. This permissive attitude toward wife beating persisted until the end of the 1800s when public sentiment was that such behavior was wrong, although there was no criminal charge for such behavior. However, even during the late 1940s in England, wives could be physically assaulted or punished by their husbands for not obeying them. Legal protection for wives who are assaulted by their husbands continues to be limited in many parts of the world, including the United States. However, currently shelters for women who suffer abuse from their husbands are increasingly available around the country. With the appropriate answers regarding domestic violence and its treatment and prevention, policy makers will be better equipped to determine laws that facilitate the appropriate functioning of families. Laws will enable offenders to receive treatment while maintaining the integrity of their families. Domestic Violence and the Media - Research papers on domestic violence and the media can look at how the media handles the issue of domestic violence. 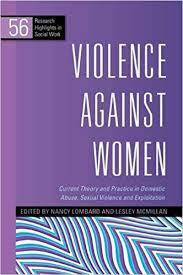 Literature Review on Domestic Violence - Literature Review on Domestic Violence are custom written. Running Head: Domestic Violence - Research Papers look at a sample of a paper order on a sociology topic with specific format requirements. Physical Abuse research papersoverview the effects of abuse on children, women and men. Paper Masters writes custom research papers on Domestic Violence Research and study the research in order to find out how to stop domestic abuse.